The Rainjunkies are an original four piece band based in Lexington, Kentucky whose music mixes acoustic and electric textures into a unique sound that ranges from organic backwoods whispers to full-throated indie rock. The manager of one well known club compared them to The Pretenders with a hint of twang. If the roots of the band's sound are firmly planted in rock and all manner of Americana, the trunk is the songs themselves, powerfully literate and evocative. 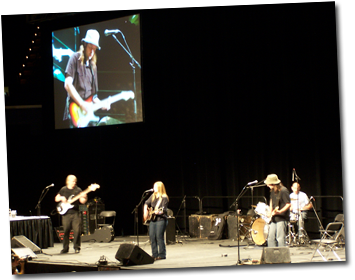 The Rainjunkies have shared the stage with many local and touring bands including Stacey Earle and Mark Stuart, Wussy, The Seedy Seeds, The Tillers, Hoots & Hellmouth, renowned pop singer-songwriter Paul Williams, and late bluegrass legend Homer Ledford and the Cabin Creek Band. The Rainjunkies' debut album, Reach for the Water, was released in 2004 and featured cellist Ben Sollee. They are currently recording a slew of newer material for an upcoming EP and a new full-length CD. Abby Lane is the lead singer and songwriter of the band, and her dynamic and achingly expressive vocals are at the center of the band's distinctive sound. She plays rhythm guitar and also adds harmonica to a few songs, and plays dulcimer, piano and organ on Reach for the Water. Bryan Klausing plays lead guitar with a songwriter's ear and a taste for swampy, and sometimes delicate, atmospherics. He also occasionally plays lap steel, mandolin, dobro, and even violin, depending on the mood and need of the song. Bryan has handled booking, artist relations, stage management, and associate production for the Woodsongs Old Time Radio Hour since 1999. Smith Donaldson has played bass with such nationally known acts as Alejandro Escovedo and Ellis Hooks and also plays with Lexington blues rock boogie band The Tallboys. Brian Connors Manke is the drummer and percussionist for the Rainjunkies. His prior drumming experience was primarily in the Cleveland punk scene, but his wide range of musical interests is on diplay in his playing, his participation in the March Madness Marching Band, and his eclectic weekly radio show "Flying Kites at Night." grow area. grow area. grow area. grow area. grow area. grow area. grow area. grow area. grow area. grow area. grow area. grow area. grow area. grow area. grow area. grow area. grow area. grow area. grow area. grow area.